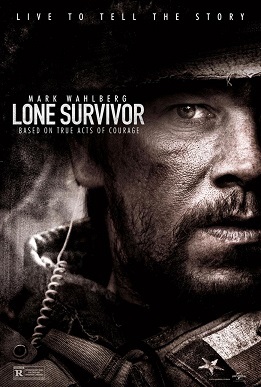 “Lone Survivor” – A Christian reflection on the film | J.W. Wartick -"Always Have a Reason"
I watched Lone Survivor recently with a friend. I’m a fan of war movies (my favorites being “Patton,” “Midway,” and “Gettysburg”), so I figured i’d probably enjoy this one. I was surprised at points at the depth of the film’s narrative. Here, I will be commenting on the content on the film; not on the true story itself or any side-stories that came off of it. There will, of course, be SPOILERS for the movie in what follows. I will not be summarizing the plot, which may easily be found here. Early in the film, the SEALs encounter a situation which brings them to a trilemma: local goat herders compromise their mission security. They are left with three options: they may let the herders go and run for the hills themselves, knowing that a huge number of hostiles will be pursuing them; they may tie the herders up, hoping that they would be found before they died from local predators or cold; or they could terminate the prisoners. The latter two would violate the rules of war, but the soldiers themselves had little chance of surviving with the first option. Their decision is eventually made after some tense debate; they free the prisoners and flee to try to call for an extract. The SEALs clearly did the right thing in this situation, not purely from a legal perspective but from an ethical perspective as well. The murder of innocents to preserve one’s own safety is not justified. However, the situation also illustrated the intense complexity of the situation of such a war. It also illustrated the very human emotional struggle we would go through in a similar situation: how would you deal with the trilemma? Can you answer it honestly that you would put your own life in extreme peril? Tough questions. I was a bit worried that the film might serve to portray a simplistic good/bad guy dichotomy in which anyone who looked remotely Arabic was painted as a villain and everyone that moved was to be killed. That was not at all the case. Although it is clear that the Taliban are the “bad guys” in this film, Marcus Luttrell, the “lone survivor,” is ultimately saved by a local who was following Pashtun codes which grant protection for those in need. There is thus illustrated in the film a greater range of rightness and wrongness than simply good/bad guy. Ancient customs may present a beautiful way to provide succor for someone in need; even a possible enemy. The adherence to strict codes for hospitality is something to which Christians should relate; one need only to read the Bible to discover numerous commands to give relief to the foreigner in the land of Israel or to take care of those in need. The situation in the movie is made interesting because Luttrell was a combatant and it was truly dangerous to those who would take him in to do so. Christians have a wide variety of views when it comes to war. There are strong traditions of pacifism and just war theory, with a spectrum of variances of these two major positions along the way. I am not a political analyst, nor am I up-to-date on the facts related to the war in Afghanistan. Thus, I’m not going to try to comment on the specifics of the war because I would betray ignorance. However, I do think it is important to note that the film does depict some truly evil actions taken by the Taliban in the beheading of a man simply because he may have spoken to the Americans. But does the issue of violence end there? Does that mean we should intervene? After all, if Americans weren’t there to begin with, such violence (perhaps?) would not happen, for there would be no Americans to inform. But I, again, want to emphasize I don’t know the whole story. I do think that a book by William Cavanaugh, The Myth of Religious Violence, brings into question some of the assumptions we have regarding religion and violence in situations like Afghanistan. “Lone Survivor” is, unquestionably, a brutal film. There is much violence as well as quite a bit of vulgar language. But amidst these things, the film managed to convey a picture of the war in Afghanistan that was more than a simplistic black-and-white picture. It poignantly portrayed the difficulties of ethical situations in war. It also called into question the notion that there can be quick-and-easy lines drawn for friend and foe. I recommend the film for adults. Lone Survivor and Insufferable Anti-American Self-Righteousness– The film has caused quite a bit of critical discussion. Here, a soldier reflects on the reaction to the film. Having now seen the movie, I think the viewpoint offered here is interesting and worth the read. Did you see or hear about the interview a reporter did with Luttrell and Wahlberg? At one point the reporter said something that suggested to Luttrell that his comrades died for no reason, essentially in vain. It was then that Luttrell, a confirmed killing machine, began to get irate. After watching this film, do you think the reporter was justified in scared-as-a-baby apology for offending him? I would have been on my knees asking for forgiveness! Even though I haven’t seen this movie, I do know the story. However, I would assume, much like Captain Phillips, the movie will bring the story to life. Sadly, I have mixed emotions, especially knowing the outcome. They were true heroes, that’s for sure. I would guess that Luttrell would be a fairly intense individual, for sure! I certainly wouldn’t want to make him angry! Moreover, to suggest that they died for no reason is a bit absurd. I’m not totally familiar with the true story (I have the book on a waiting list at the local library), but the complexity of narrative in the movie alone suggests some interesting points, as I tried to bring out in this post. I would say that you should watch the movie; it is quite excellent, but the title obviously spoils the ultimate outcome. The way it gets there, however, is well worth the time. I thoroughly enjoyed the movie. And I just added Cavanaugh’s book to my reading list (my personal one). You will not be disappointed. I would mark it as a watershed book in my thinking. It ranks in my top 10 all-time non fiction books I’ve read. I have not watched the movie yet and I have very strong emotion about the whole story. Years ago I found a clip of the Taliban involved in the firefight and showed the ill fated helicopter before it was shot down followed by a clip of them going through gear of the dead Navy Seals (no bodies though); It was hard for me to watch the clip and they even showed the military CAC card of the petty officer DIetz. I never could find that video online after that again. I have the book and I need to read it still, our other blogger on Veritas Domain should be reviewing the book soon. Lastly, as a Marine veteran of Iraq, I have the utmost respect for SEALs and what a small group has done and sacrificed for our freedom.